Molecular Soundscapes is a Leverhulme Trust funded Artist-in-Residence project I am working in the School of Chemistry at Newcastle University. The project is a collaboration Agnieszka Bronowska (lecturer in computational medicinal chemistry), and we are exploring techniques to express chemical processes, involved in drug design, in sound. Proteins are structures inside the body’s cells which perform a huge number of biological tasks. Their shape, function, and reaction to drugs and other chemicals is determined by the order and number of the building blocks (called amino acids) which make up the whole protein. The proteins move and change shape over time, making pockets and holes in the overall shape where chemicals, including drugs, can bind to the protein, changing its shape and how it behaves and performs its functions. Understanding these shape changes helps scientists to explore the positive and negative effects of new drug designs. In Molecular Soundscapes we looked at new ways to represent the effects of drugs on proteins in the human brain by turning their movements into sound. The proteins we looked at are important for research into tackling diseases such as Alzheimers and Parkinsons. Bronowska’s research group simulates protein-drug complexes (the process of a drug binding and unbinding to a protein) in order to develop new drug designs. I have used the data they produce relating to the protein’s structure and movement to make an interactive sound installation; algorithmically generated musical scores for instrumental performers; and performance system for making electronic beat-based music. The installation will be accompanied by animations showing the protein structures and movements. The sound installation uses layers of pitch and timbre mapping to describe the shape, structure and trajectory of the protein. Tempo changes according to the deviation of the protein from it’s initial state over time, and spring resonances show the relative flexibility of the proteins constituent parts. Ambisonic spatialisation is used to connect the pitch mappings to space, in effect drawing the shape of the protein in space using a combination of pitch and spatialisation parameters. The scores are based only on the Alpha-helixes and Beta-sheets in the protein – these are secondary structures within the overall protein structure. 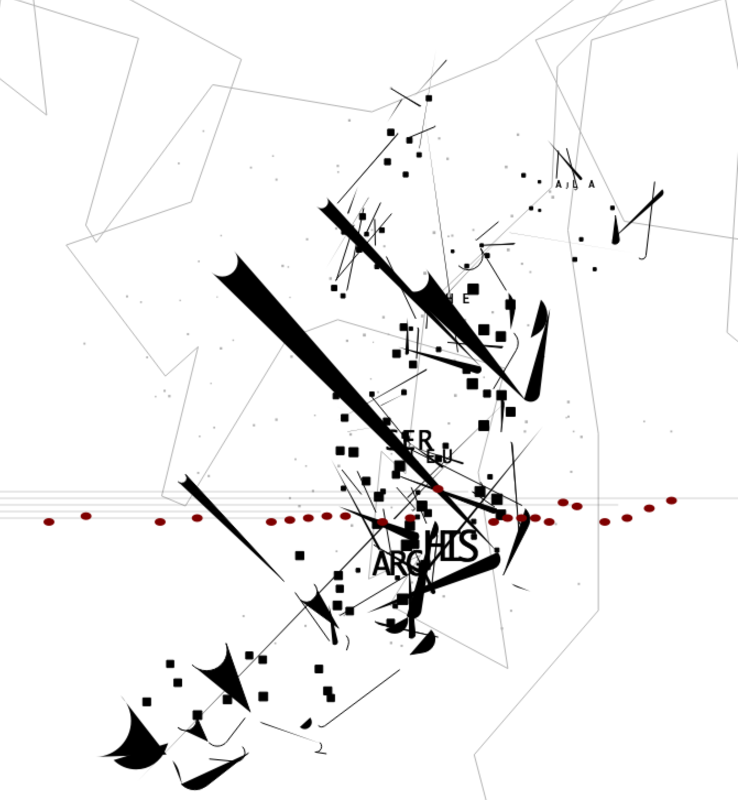 This allowed me to work with a small subset of the data to produce graphical forms and minimal music notation which can be interpreted as a score. As part of the residency I spent a week working at Foam Kernow, an art-science research lab run by Dave Griffiths and Amber Griffiths, you can find a write up about that residency here. I also spent two week at Culture Lab working on an 8-channel sound system developing the ambisonics spatialisation. At the end of the residency we are holding an Algorave where we will share protein data structures with Algorave artists to produce algorithmic dance music and visuals.